NO DOUBT: Matthew Straka’s photos of signs leave a lot to the viewer’s imagination. Santa Barbara continues to cultivate a flourishing photography scene, and this new one-man show of images by former Independent photo editor Matthew Straka offers a great example of that. It’s not so much that these pictures could only have been made by a Santa Barbara native such as Straka as that they express the restlessly cosmopolitan way of seeing that binds our city’s disparate image makers into a community. Drawn from three separate streams of images that the artist posts regularly on his website (matthewstraka.com), the photos in Observed/Observer cover a lot of ground. At the Architectural Foundation, the images of bird-watchers, disaster tourists, and assorted amateur photographers that Straka groups under the heading “Passive Observation” on the web hang side by side with shots from his “Manufactured Landscapes” stream. The latter images represent Straka’s greatest achievements in composition and color, displaying a well-earned sophistication about the technical aspects of photography without calling attention to their virtuosity. 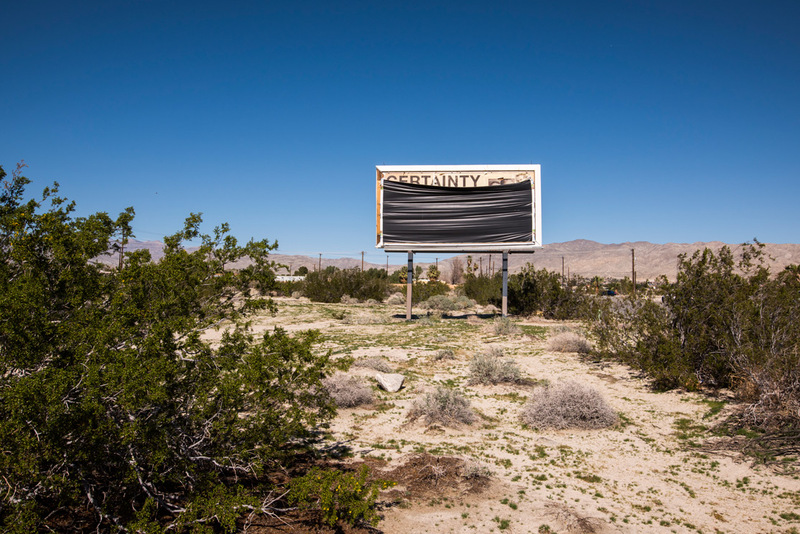 In images such as the desert billboard shrouded in black plastic but for the single word “CERTAINTY,” Straka delivers the kind of semiotic punch one associates with the tradition of Walker Evans and Robert Frank. One thing’s for certain in this picture, and that’s the fact that the complete message of the sign is currently unavailable. Take that, Roland Barthes. Straka’s ebullient approach to shooting abandoned interiors yields results that rival those of past California master photographer John Divola, whose career retrospective As Far As I Could Get at the Santa Barbara Museum of Art stands as one of that institution’s greatest contributions to our civic dialogue. Whether it’s a trailer-dwelling folk artist or a flock of high-flying birds that Straka captured on one of his frequent trips to the Salton Sea, his photos always convey an aesthetic urgency that transforms them from documents into art objects. Straka has expressed his desire to create images for the viewer to get lost in, and this exhibition leaves no doubt as to his ability to achieve that elusive goal. After a recent journey to Washington, D.C., with his dad, Straka created a small book of images as a personal memento. These pictures can also be seen in the show in part because he likes to emphasize the way that digital photography has altered the frequency and function of image making. Trained in the now-dwindling craft of darkroom color correction, Straka handles paper and ink with the eye and hand of an experienced printer, something that fewer photographers will be able to say going forward. Whether it’s cracked earth, an abandoned recliner, or a misty green landscape as seen through the busted-out window of a graffiti-covered wall, each of these photos reveals something about the medium ​— ​how it’s used now, what it has been, and what it still could be.